Download the jTDS 3rd party JDBC driver, version 1.2.8 from here (I’ve not personally tested with other versions). Save and extract the contents of the jtds-1.2.8-dist.zip file somewhere safe (I extracted mine under “C:\oracle\sqldeveloper\add-ons\jtds-1.2.8-dist\”). Start SQL Developer go to Tools > Preferences > Database > Third Party JDBC Drivers. Click “Add Entry”, point to the ‘jtds-1.2.8.jar’ file location, then select it and click OK. Create a new connection, and choose the “SQLServer” tab. Enter the following details: Connection Name (required for database retrieval), Username, Password, Hostname, and Port. Click “Retrieve database” and select the appropriate database, then Save/Test/Connect as you would do normally. You’ll notice from the screen shot above that you can also use this to connect to Sybase databases, although I’ve not tried this out myself. Status : Failure -I/O Error: SSO Failed: Native SSPI library not loaded. Check the java.library.path system property. Thank you Very much. Your Article is very useful. Really good article, to the point. Thanks a ton! Thanks, and it worked for me. thx, worked for me. Spent hours but this did it. Keep it up. This works, but unfortunately there are a number of shortcomings. Some key words used in T-SQL and SQL Server scripts like ‘GO’ and ‘EXEC’ don’t play nicely with Oracle SQL Developer. Also issues with Stored procs that return multiple result sets etc. It really depends on your environment, but if you’re dealing with a lot of large scripts that were written in T-SQL you’ll find issues. 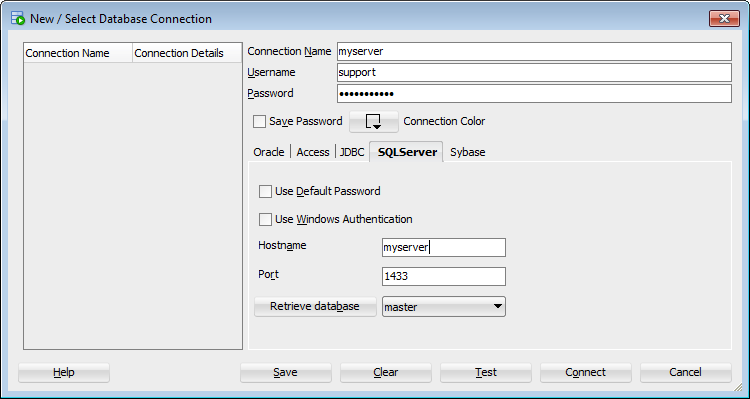 Below steps worked for me to enable you to create and connect to SQL server connection instance in SQL developer. 1. Download the jTDS(jtds-1.2-dist) 3rd party JDBC driver. 3. Start SQL Developer go to Tools > Preferences > Database > Third Party JDBC Drivers. 4. Click “Add Entry”, point to the ‘jtds-1.2.jar’ file location, then select it and click OK.
6. Open SQL Server Configuration Manager. 7. Click on the SQL Server Services. In the details pane, restart the SQL SERVER(SQLEXPRESS) instance. 8. Expand SQL Server Network Configuration. Click on the Protocols for SQLEXPRESS. In the details pane, right-click TCP/IP, and then click Enable. 9. Select and Right click the “TCP/IP”, go to Properties. Select IP Address tab. 10. Mention port number “1433” in all “TCP Port” fields. 13. Create a new connection, and choose the “SQLServer” tab. 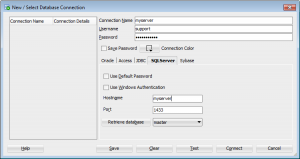 Provide Connection name, SQL server user name and Password. 14. Give Host name as your SQL SERVER host name. 16. Click on Retrieve database, select DB. 17. Click on Save and Connect. Thank you for sharing Ambareen! if you are using sql developer 4.0 and above, you need to Download jtds-1.3.1-dist.zip. Thanks for the update Amit!